Home-brewed Happiness: Sleep all day. Party all night. Never grow old. Never die. If a person says he does not like to party, chances are he hasn’t met crazy animals of his like. Partying might not always mean wearing as less /better as possible, boozing and hitting the floor, dancing like no one’s watching, saying what might look foolish otherwise, shouting at the top of one’s voices, gormandizing on great food, cribbing hearts out, crying, laughing or in short wasting time ‘living your life’. It might also mean the above lines paraphrased! On my way to growing up, I might have attended numerous parties, with families, friends, people I don’t know or rather don’t remember, and for a number of random reasons, one of which also includes my friend’s losing her iPhone 5—that calls for a party too! So now, all eyes are set on me, for I am going to play host to the most tantalizing, happening, wishful, legal, and, of course, most tasteful culinary adventure in the town, MY PARTY where everyone but the ones I choose to invite are allowed to watch and sigh from either outside the gates or from terraces of their homes. 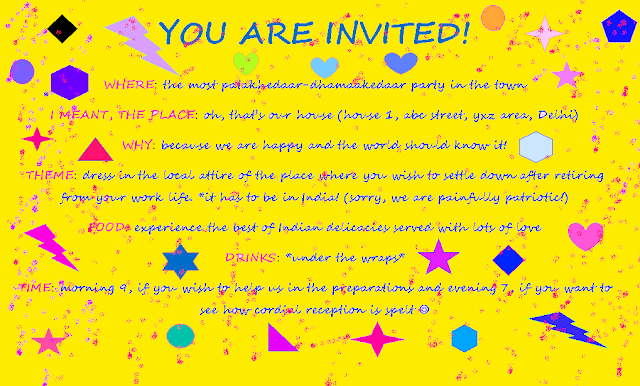 The most pataakhedaar-dhamaakedaar event calls for an extra-special invite too. The location has to be our own home. The reason why I am choosing my home as the venue is because it will prove to be a nice place for overnight stay for guests who wouldn’t feel like going back home after an exhaustive evening. Another reason which should better be kept under the wraps is that by partying at my home, I will end up saving a lot on setting up a venue and thus, could spend much much more on good food. 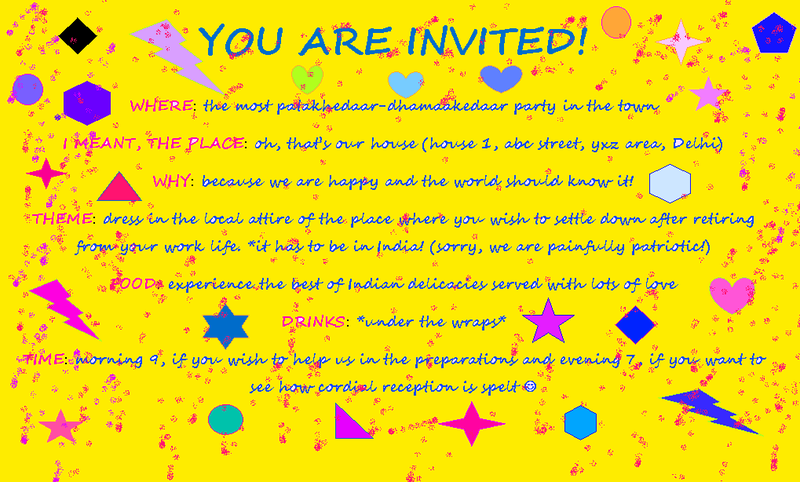 Now, because the party seeks the guests to dress down and come in the attire of the place where they would want to settle having retired from work, it would be great fun to see everyone’s wishes so explicitly exhibited. Another glorious aspect of my party—the food—would be a perfect concoction of the best of north, west, south and east, so that all the guests could foresee their retirement days and imagine themselves having the best of what their dreamland could offer. All the parts of the meal, be it starters, main course, desserts or drinks will showcase what our country is popularly known for. Since hard drinks are common to all the states, that clause will be kept open and the best of booze will be made available. 7 PM: Meet and greet our clan. No kisses-in-the-air allowed—it has to show on *cheeks* if at all it has to happen. 7:30 PM: Let’s dive into chitchatting and see where all of us want to settle and why. Why everyone feels life after retirement would be better than now. Time to let the cat out of the bag! 8:45: Dance floor is open to be rocked and rolled. Get the best out of you today. 9:30 – 11:00: Pamper your taste buds with the best delicacies out there. 11:00: Cards, carom, PlayStation, dance floor, gossips, show-off, food, everything is available if you wish to be further pleased! 12:00: Head home or to the bed. The best of the dreams are waiting for you to close your eyes. Anyway, no one looks back on their life and remembers the nights they got plenty of sleep. I hope all my guests remember the pleasant experience plenty of spare time and reason to celebrate brings along! I remember a saying which makes me want to revel even more, if life is a waste of time and time is a waste of life, then let’s get wasted and have the time of our lives. This blog is an entry to the contest ‘My Gourmet Party’ happening on Indiblogger.com. Know more at http://shopping.kitchensofindia.com/ and see what best Kitchens of India could offer you. Shruti: Thanks you your comments, dear!